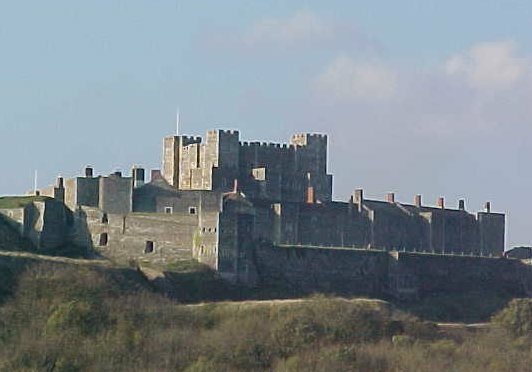 The Classical Tradition in the Middle Ages. 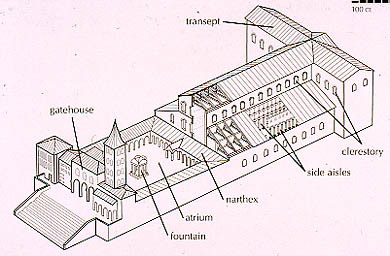 11th-12th century Reliance on Roman form in churches particularly the basilica. St Peter’s after 790 the transept expanded for the laity to enter and leave. 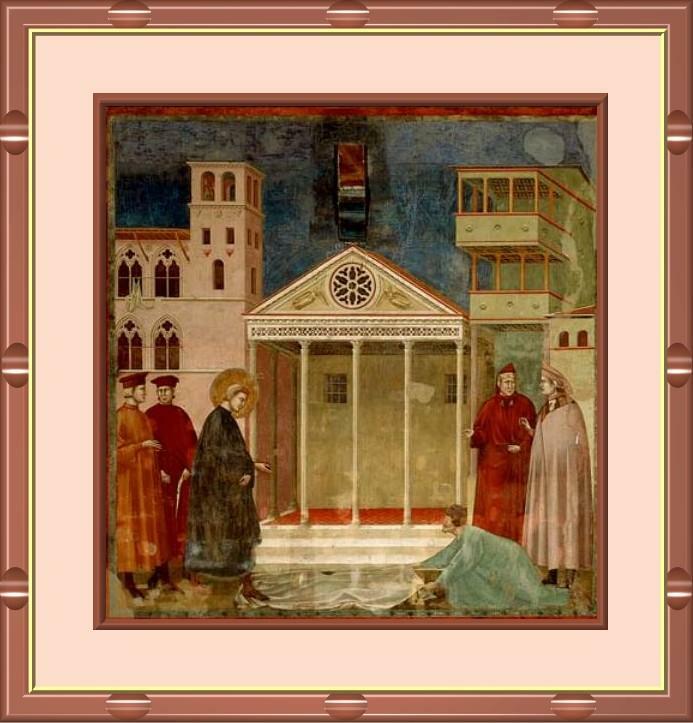 St Benedict’s regula divided the monk’s day into three equal parts. He founded the first monastic order. 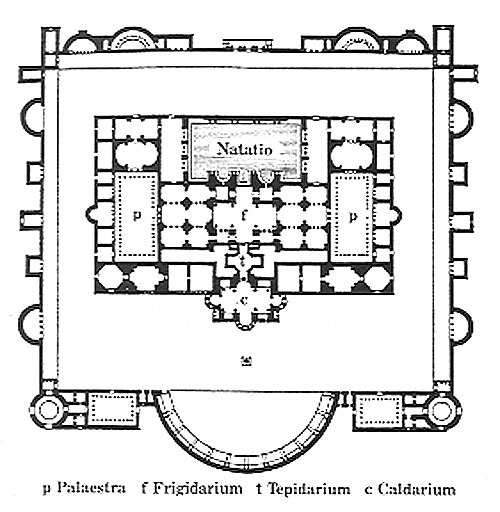 The cloister connected different parts and there was an ideal plan for St. Gall although the monastery was never actually built that way. 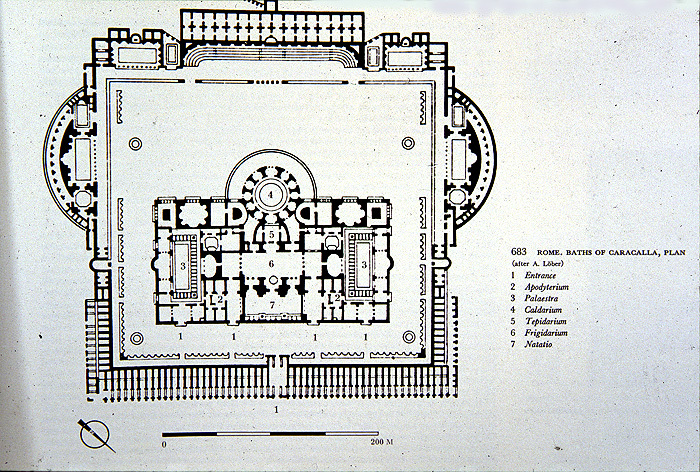 A similar plan is for the Baths of Caracalla. The elevation and outline of churches at about 1000 is very different from any Roman buildings. 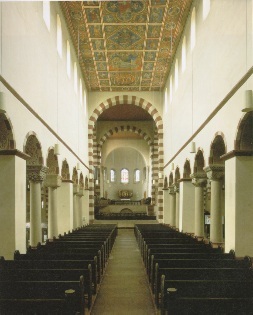 There is powerful massing in a Romanesque church such as Hildersheim. Bernward’s column copies the structure and narrative structure of Roman Columns such as Trajans. It shows religious themes rather than battles. 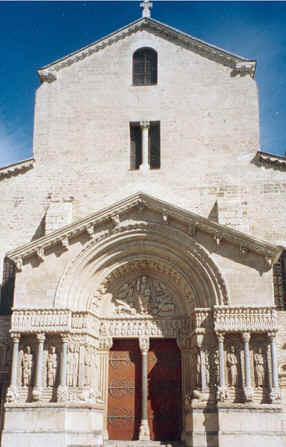 One of the most important churches of the 12th Century was Cluny. There were three stages of building. 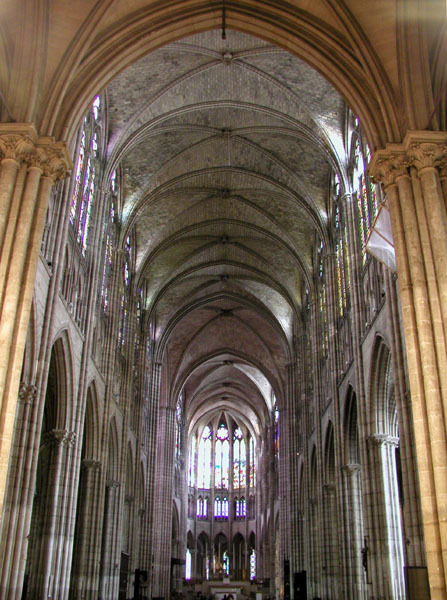 Cluny III has a main nave with side aisles and an apse with an ambulatory and transepts that include chapels. Clunians needed as large scale church for their excessive number of services and praying. 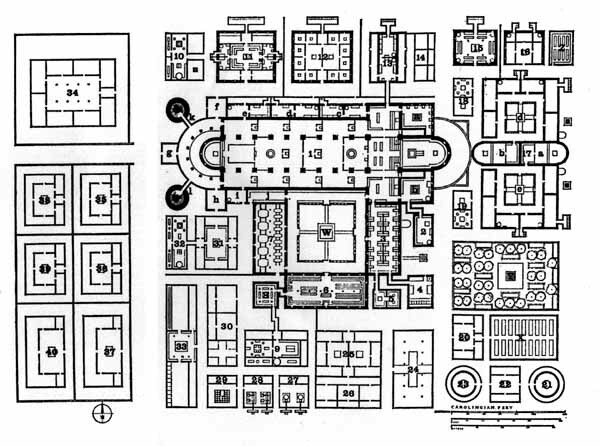 Clunian reforms and its innovative architecture was carried across Europe. 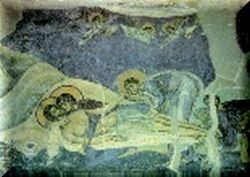 Many of its features and images were classical. 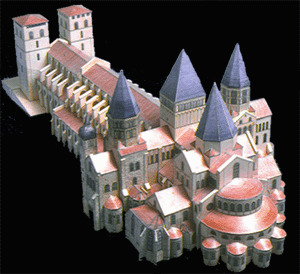 Berze la Ville in Burgundy remains and shows us what the features of Cluny may have looked like. 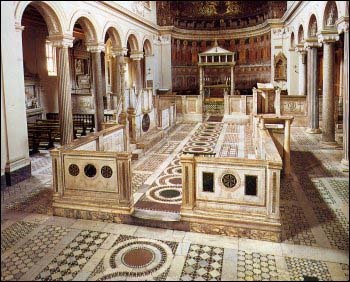 At the same time following the “investiture conflict” the Popes emerged renewed and they went on a spending spree and built new churches like 12th S. Clemente. Spolia (booty or plunder) – reused Roman columns and the use of mosaic on a large scale. This comes from their use at Montevideo also in the 12th century. 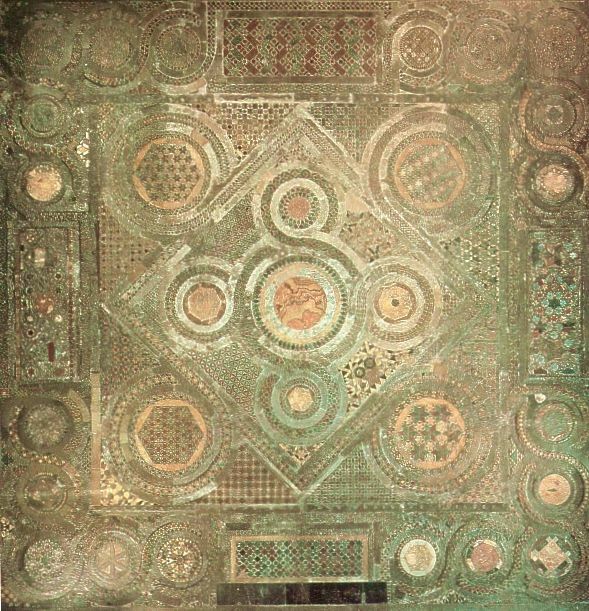 The floor is a Cosmati floor (type of mosaic technique that was practiced by Roman decorators and architects in the 12th and 13th centuries, in which tiny triangles and squares of coloured stone (red porphyry, green serpentine, and white and other coloured marbles) and glass paste were arranged in patterns and combined with large, stone disks and strips to produce geometric designs) and is used everywhere named after a family (?). 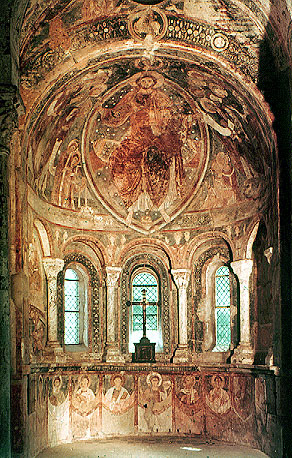 Image of the wine in the apse linked to the Eucharist. 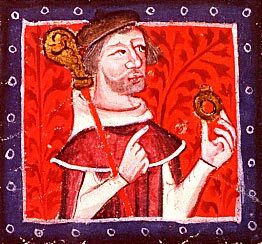 Patrons of the 12th century like Henry of Blois in England looked back to classical tradition for their designs and he went to Rome and collected classical statues and Roman art. 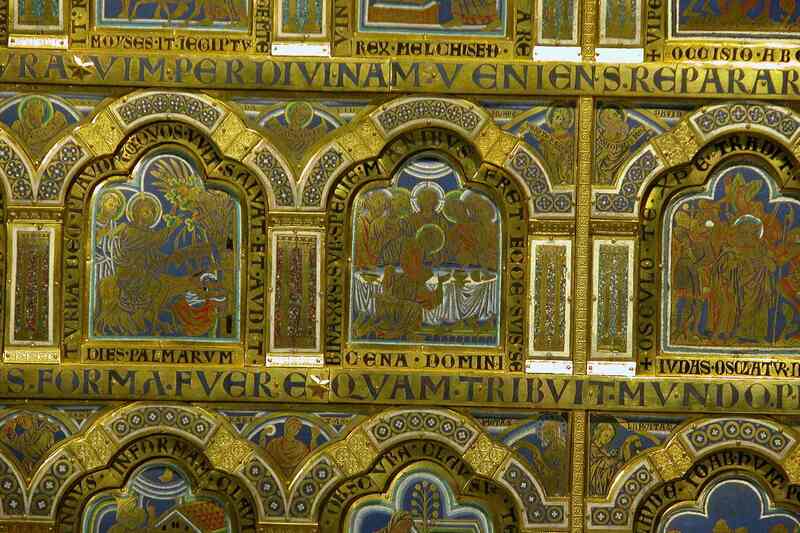 Early 10th century pulpit in Aachen shows the use of jewels used to create the earthly version of Jerusalem – see the Mass of St Giles to see the ornamentation used in St Denis. In the Mosan (?) 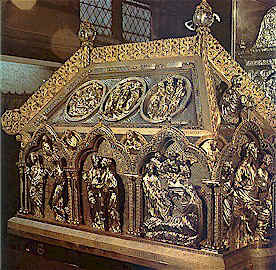 region high quality metalwork started to be developed for churches such as the Liege font. The softness and tenderness of representation speaks of a classical influence but we do not know where they got it from. So why didn’t the Renaissance happen then? Their interests led them in a different direction. 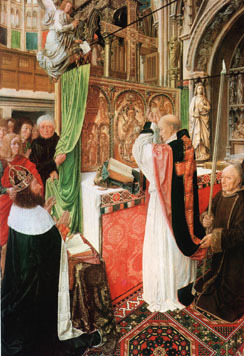 The altarpiece at Klosterneuberg links the old and new testament scenes in a narrative way. Very different from our own understanding of the texts. 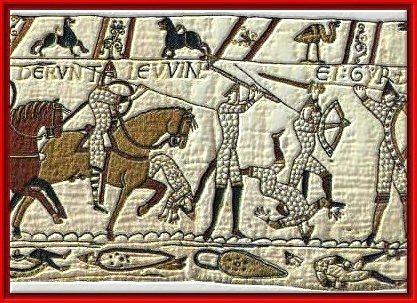 The Bayeux Tapestry (technically embroidery) also shows a narrative. Note that text is included in both to explain the story. The 12th century was a great period of change when power shifts from Germany to Paris. 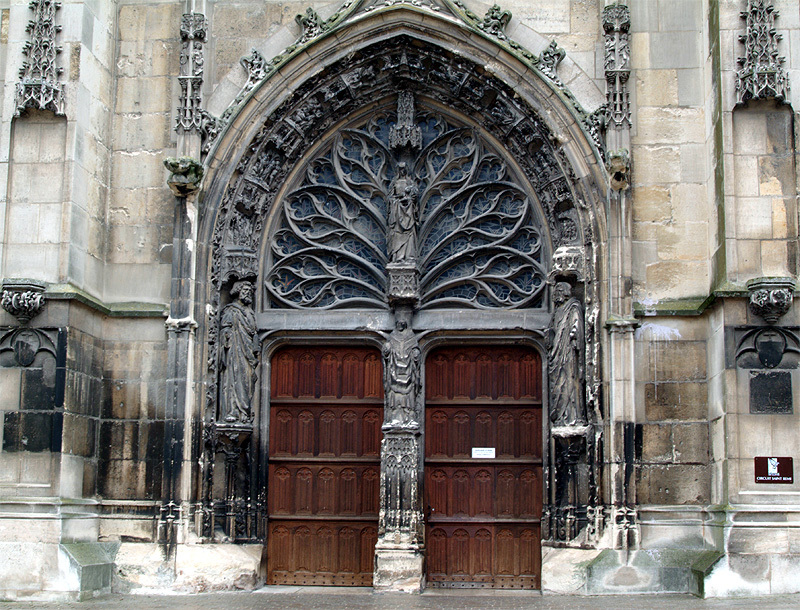 Louis VII moved from Orlean to Paris. Can be compared to Chicago tall buildings going up all the time. 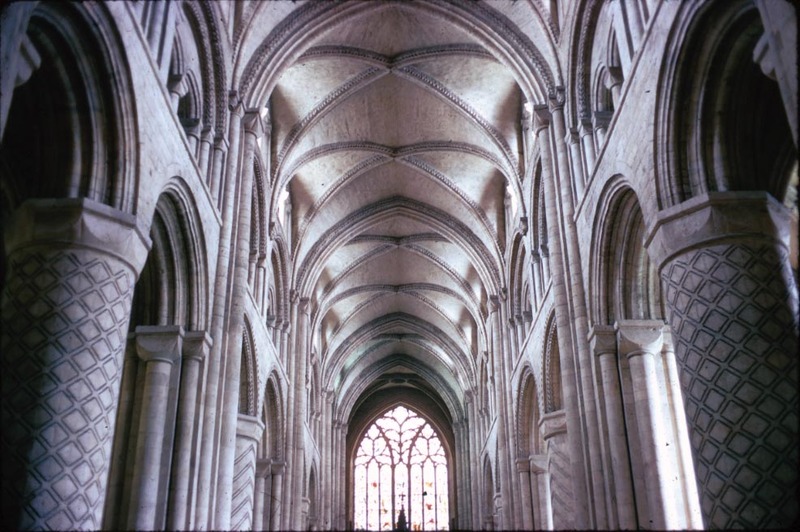 Gothic – pointed arch, ribbed vault and flying buttresses. 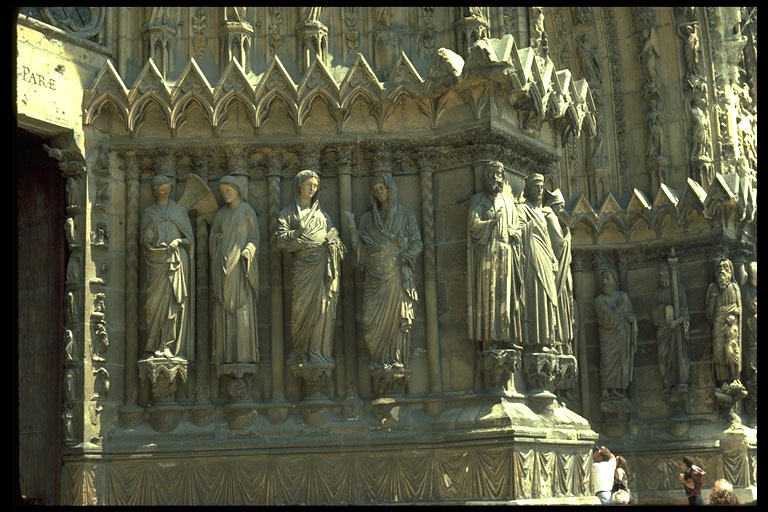 St. Denis was modelled from the West end and he then moved to the East end. 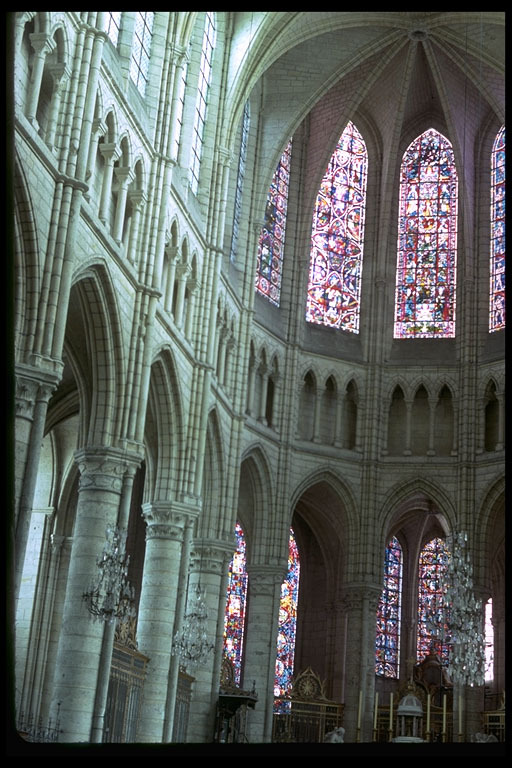 The nave between was much older and respected. Suger had to negotiate a design that fitted the new east end with the old nave and so many features are backward looking. So even this first Gothic structure look back to Romanesque and classical. 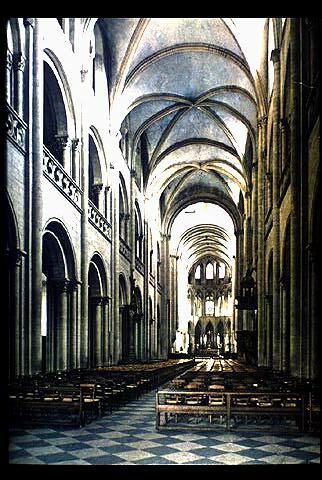 Soissons Cathedral is also an early Gothic but many features look back to, for example, aqueducts. 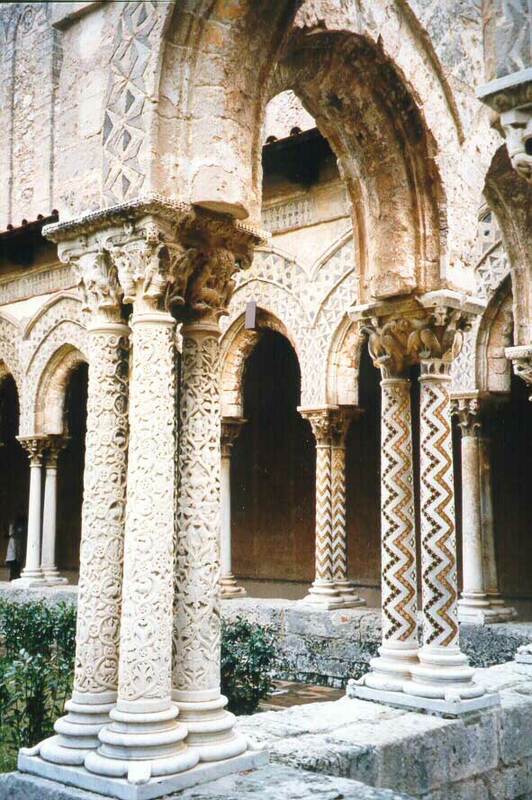 Early Gothic had Corinthian capitals and fluted half columns on the inside and outside. Autun. 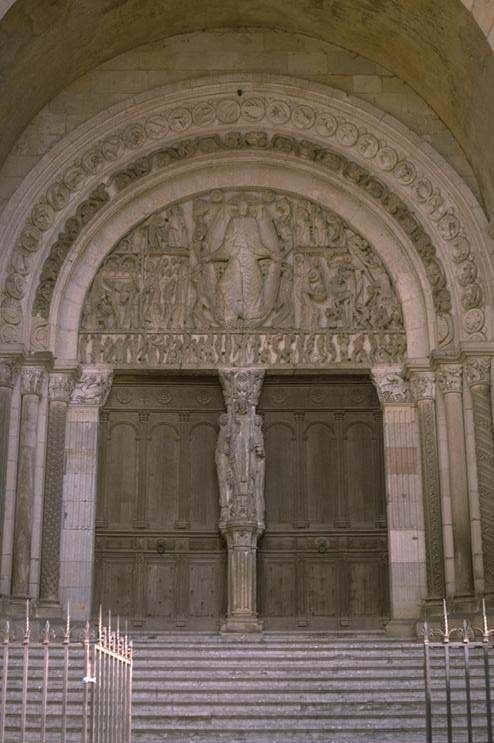 Influenced by Cluny, monumental ‘Judgement’ in tympani. 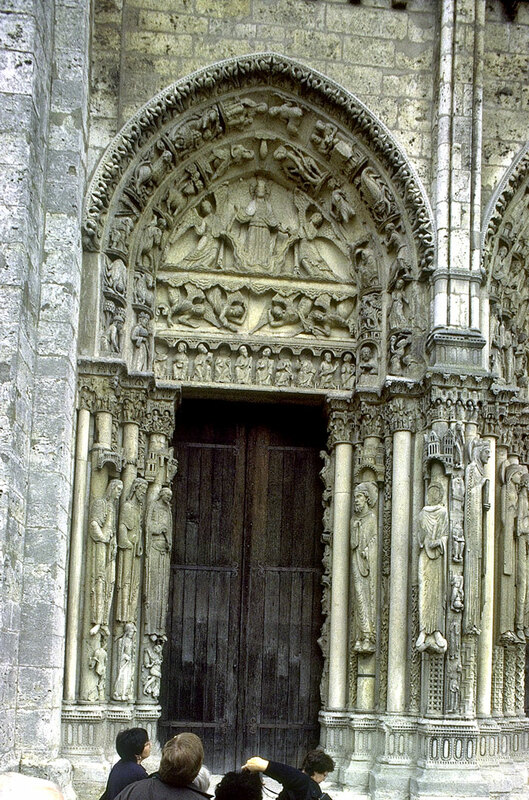 They become more elaborate as at Chartres, It also introduces caryatid figures either side of the door. They are old testament Kings and Queens. Panovski principle of disjuncture. 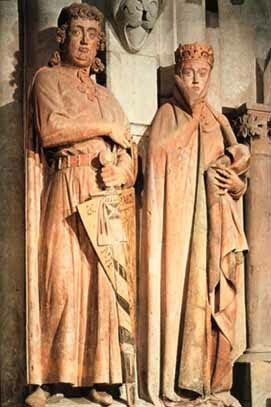 Carolingians were steeped in the past but later they used an interpreted iconography in a different way. 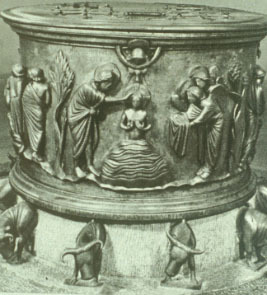 For example, idolatry is represented as worshiping a classical cameo of the type that were used by the Carolingians. 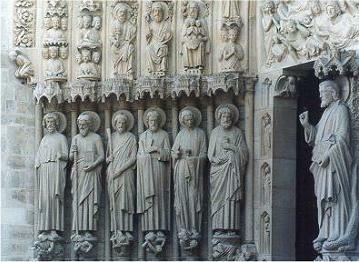 Reims Last Judgement shows people who are emerging from urns used to hold the remains of cremated people. Four figures create a sense of narrative in the way they turn and look at each other, also note they are clothed in Roman togas. Annunciation has the first instance of a figure smiling – showing emotion. The next step is shown at Naumberg where the patrons (long dead at that time) are shown with an immediacy and a realism. 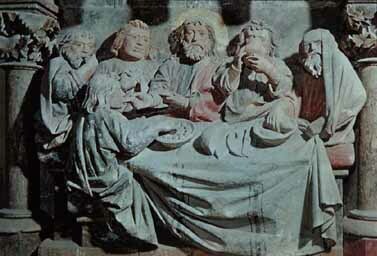 Almost like portraiture, a new interest in showing realistic figures such as the Last Supper. Soucha (?) uses a porphery Egyptian vase and decorates it. Westminster Cathedral Cosmati mosaic pavement dedicated to St. Peter. The design was also chosen by Henry III for his own tomb. Busts of Charlemagne made by Charles IV looking back to his Imperial forebearers. 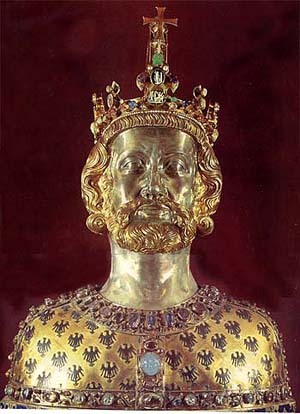 Charlemagne had been canonised. Frederick II of Sicily also liked to depict himself as a Roman emperor. Recalls head of Augustus. Why Italy? Why did the renaissance start in Italy? 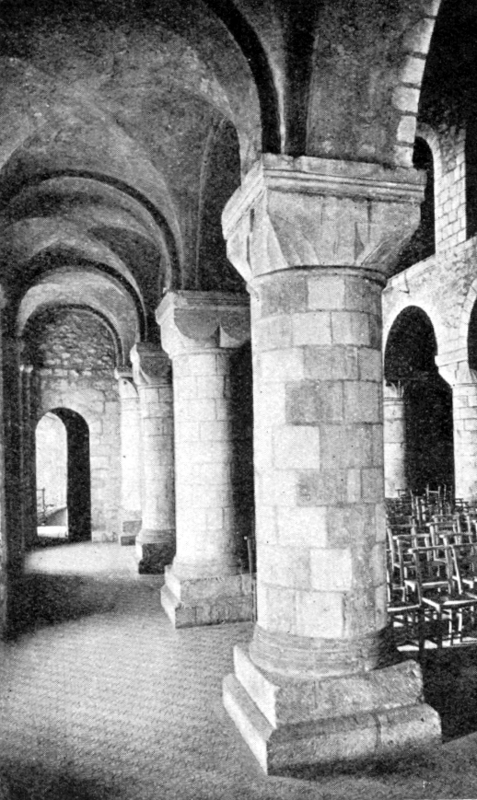 Southern France and Europe had buildings much more closely linked to classical arches and buildings. Nicolas Pisano pulpit 13th century in Pisa. Its forms, style and arrangement is inspired by classical monuments and styles, for example on Roman sarcophagi they that were in Pisa. Pisa was a Ronan town and increasingly important at the time. 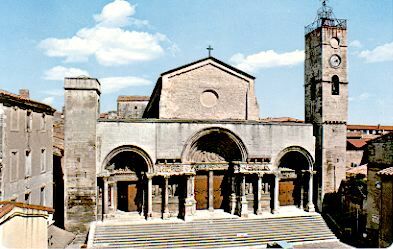 St Peter is meant to have given his first sermon just outside Pisa, not Rome. So Pisa had a claim to be the centre of Christianity. 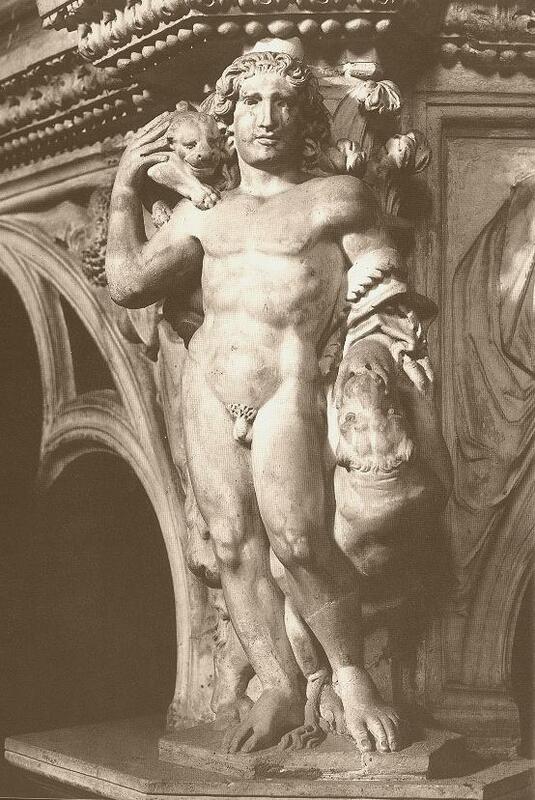 Naked figure of Hercules (?) or is it of fortitude or even Daniel in the lion’s den. 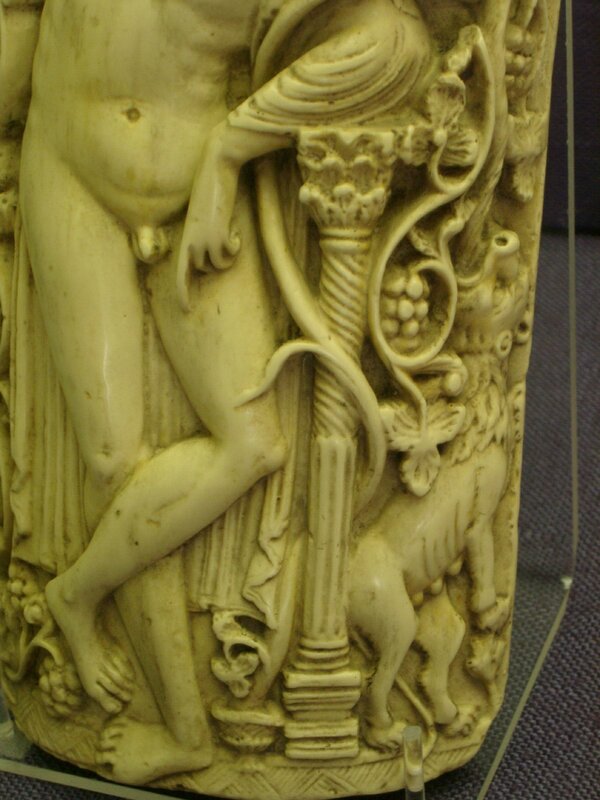 Don’t expect to see a naked figure before 15th or 16th century. Monreale, Sicily, slaughtering a bull, cult of Mithras. 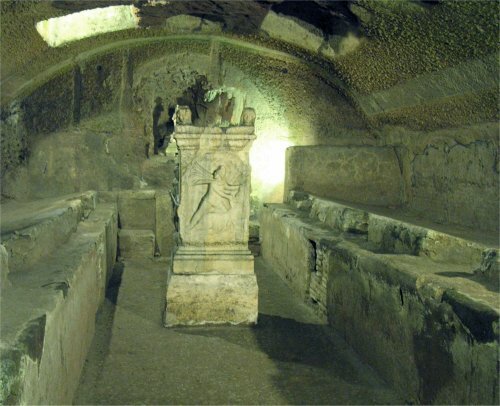 A cult that competed with Christianity in the time of Constantine. 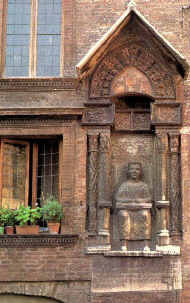 Putti on facade of Modena is also difficult to explain at this time. We come to Giotto. He obviously looked at classical sources and buildings. 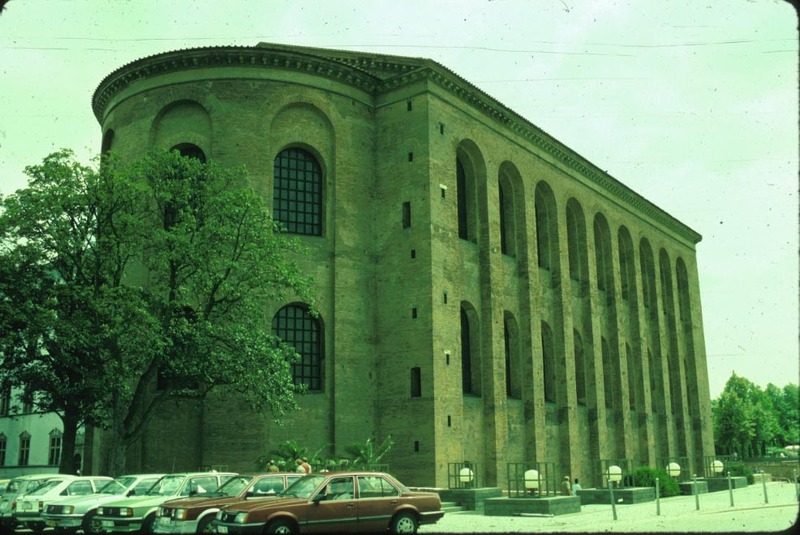 The S. Francesco portico still survives. 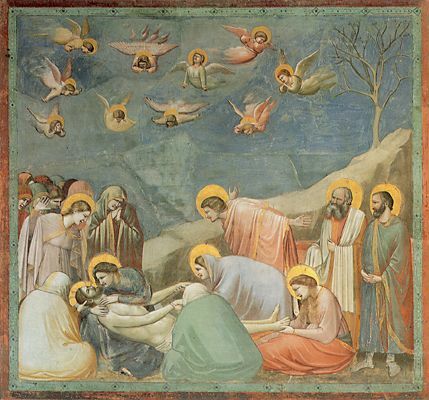 Also see similarity between Giotto and Roman sarcophagi. 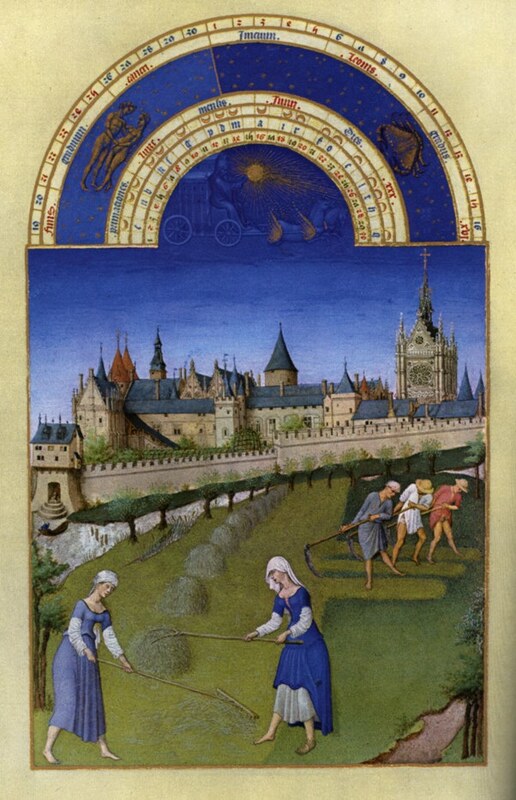 Giotto’s style found its way to Tres Riches Heures in Northern Europe. Shows walls of Paris in the month of June (?). What is the difference between the use of classical images in the Middle Ages and later renaissance images? Mantua Virgil and Mantegna’s Virgil. One with an open book on his lap and the other standing as a classically dressed Virgil. In the Renaissance they felt they were actually bringing the past back to life, in the Middle Ages they were just using it. 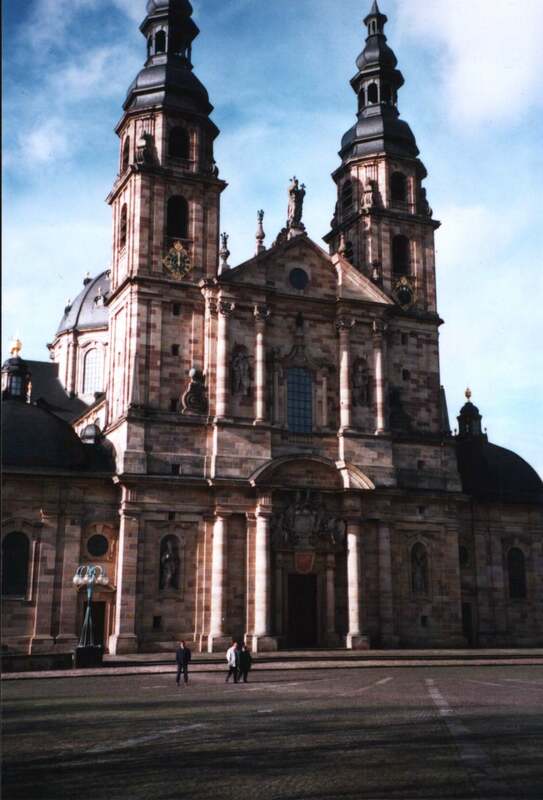 Fulda grew around a Benedictine abbey founded in 744 by Sturmius, a pupil of St. Boniface, the missionary. 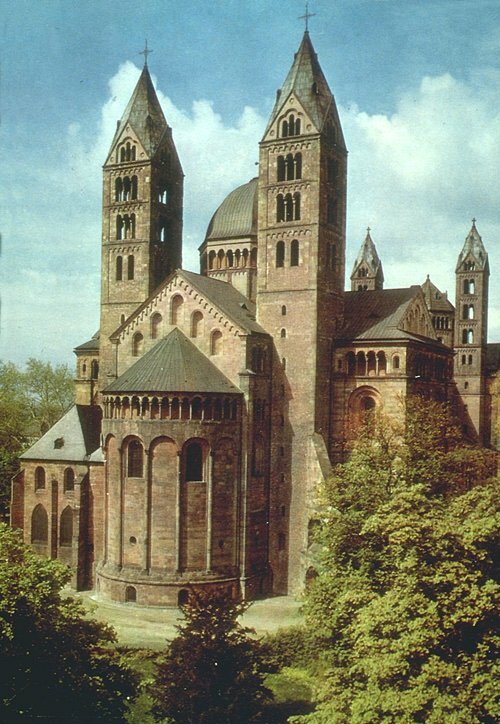 From this abbey Christianity was spread throughout central Germany; numerous scholars were associated with the abbey school. From the 13 th cent. the abbots of Fulda ruled the town and the surrounding area as princes of the Holy Roman Empire, and in 1752 they were raised to the rank of prince – bishops. Note angel on left of Annunciation smiling.